Despite claims of being horribly underfunded, Kansas school cash reserves set another new record of $952 million this year. And that’s just their operating funds; districts also set new records for capital outlay reserves ($528 million) and debt service reserves ($581 million). Total carryover cash reserves, including record-setting federal cash balances of $48 million, hit $2.1 billion. 174 districts increased operating cash reserves in 2018, while the other 112 districts decreased reserves. The data comes from the Kansas Department of Education and reflects balances as of July 1 each year. District-level data can be downloaded from KansasOpenGov.org; there are charts like the one shown above and spreadsheets listing individual fund balances or totals by major category. 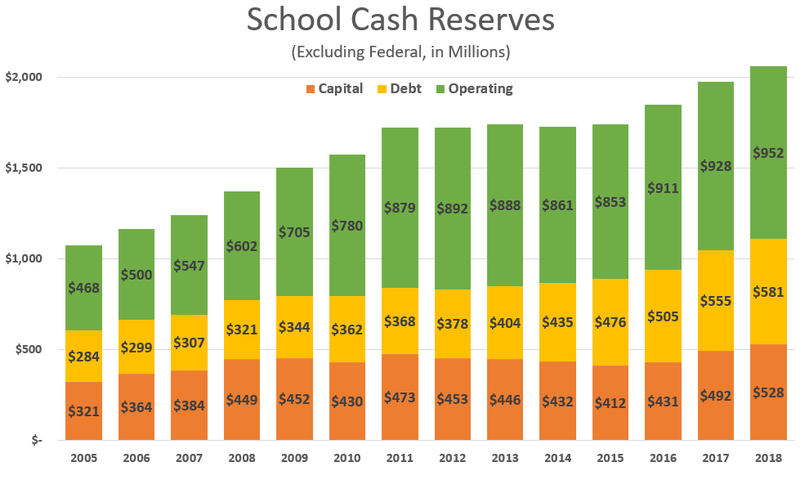 Every district needs some level of operating reserves each year, but the growth in operating reserves between 2005 and 2018 shows more than $400 million in money provided to educate students was used to increase bank balances. 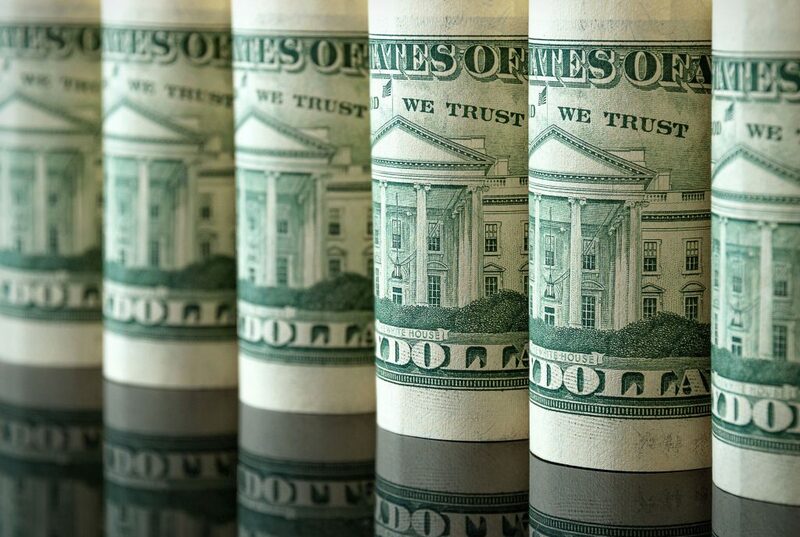 Government funds operate like checking accounts; the annual balance grows when more money is deposited than is spent. School officials have offered several excuses over the years to rationalize burgeoning cash balances, but none of the explanations stand up to accounting and statutory scrutiny. There’s no record of school districts telling courts or legislators that they lacked sufficient cash reserves prior to Kansas Policy Institute’s discovery that schools had $705 million in operating reserves at the end of the 2009 school year. That’s significant for several reasons. School cash reserves were at $452 million at the end of the 2005 school year, just before the last big court-ordered funding increase began; four years later those operating cash reserves reached $705 million, meaning a significant portion of the increase wasn’t needed to educate students. The Department of Education advised districts to consider increasing reserves while the state was late making payments during the recession, but that doesn’t explain away the increase leading up to that point or additional increases that occurred once payments were made on time. Some legislators and education officials blame a Sebelius-era budget-balancing gimmick for the ‘appearance’ of large cash reserves. Schools’ final aid payment of the 2003 fiscal year was delayed one month (from June to July); the payment didn’t count as spending on the state’s books until the new year but schools were required to report the money as received in June, thereby giving the appearance of having more money on hand July 1 than they actually had. But even though that practice has continued ever since, the effect on the increase in ending cash reserves was a one-time event, as districts received the same number of payments each year thereafter. Accordingly, the increase in year-end cash balances results from spending decisions. Some education officials claim schools only have a few days’ worth of spending on hand, but such claims only count a small portion of operating reserves. 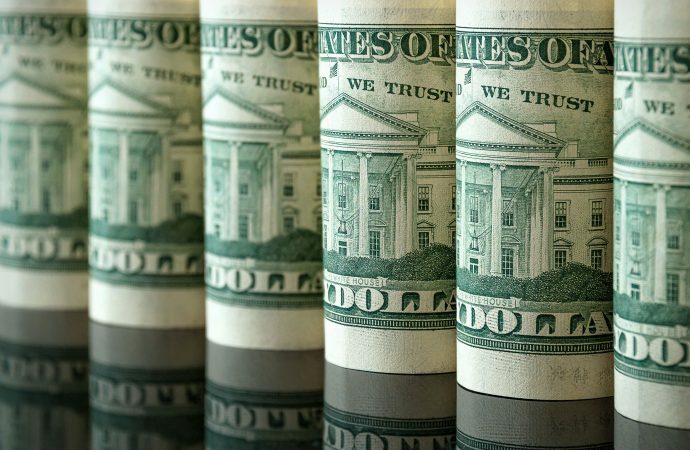 Most often that claim is based on the balance in the Contingency Fund, but that is just one of about a dozen funds holding operating cash reserves. At the end of the 2017 school year, districts averaged 19.3 percent of operating expense in reserve, and that includes operating spending on KPERS retirement funding and federal spending. No reserves are needed for KPERS and federal funding isn’t included in the operating cash reserve totals. Another common but very misleading claim is that school operating cash reserves are restricted. The most common example cited is money set aside for debt service payments, but that money isn’t included in the operating cash total. As noted earlier, that $581 million is accounted for separately. Many of the restrictions that once existed on operating funds have been modified by the Legislature but districts have used very little of their new authority. Only a third of Special Education reserves can be spent on other needs, but a third of the $192 million left over at the end of last year could have done more good elsewhere. The $68 million left over in the Food Service fund can’t simply be transferred out (because of poor accounting practices that fail to separate state and local tax dollars from other sources) but there’s still a way to effectively use that money; instead of transferring new money into the Food Service fund, spend it down to zero and get implement better accounting practices in the meanwhile. The same can be done in other areas. The fact that many school districts haven’t spent all of the state and local tax dollars they’ve received over the years, and instead, used it to increase cash reserves underscores the hypocrisy of claiming to be underfunded.